Ha! 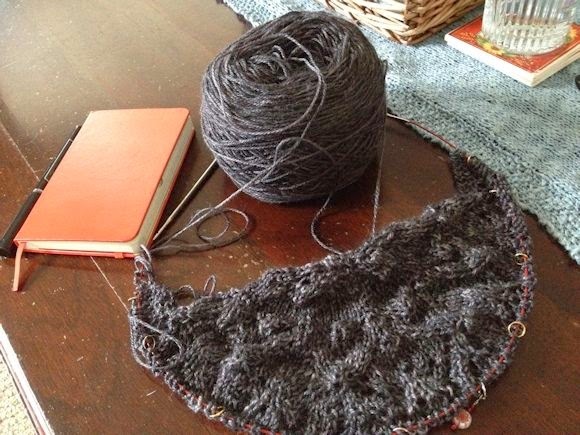 I've started another shawl, since finishing this cowl. This shawl is a challenging one and I love that the directions are all charts! I'm in chart heaven :) I believe my knitting love will always be with shawls-knitting and watching each row grow is satisfying. I finished Tell the Wolves I'm Home and enjoyed the book immensely. I was sad when I read the very last page then spent the rest of the day mulling over the whole book. As I said last week, the book is about a girl who is 14 years old and she is grieving for her beloved Uncle, and the series of events that unfold as she learns of her uncle's true life. The story is about compassion and family secrets. I continue to read about David Copperfield and have chuckled at his life at boarding school, his quirky acquaintance that he meets along the way. I love how I hate a character that I'm supposed to hate, and love the ones I'm to love. A good read indeed! What are you knitting and reading this week? 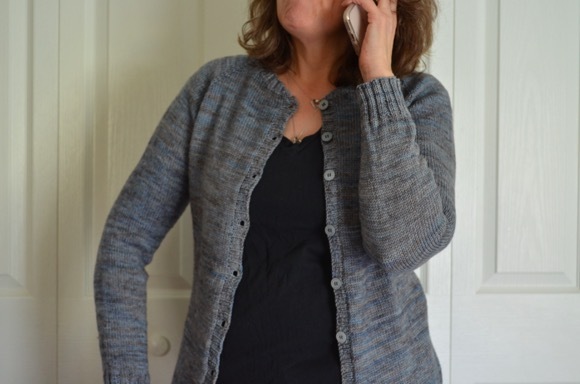 I love that you endless knit shawls ;o) - but what do you do with them all? Why wear them of course....or gift them away. I go in phases of what I like to wear in certain seasons....I don't wear orange after thanksgiving...you know that kind of thing! I loved Tell the Wolves I'm Home! It was well-written, poignant, and so good that I still think about it several years after reading it. I just started All the Light We Cannot See and I have a feeling it's going to be just as good. I look forward to seeing progress on your lovely shawl! I will look for that book, I just loved how I thought and felt after the wolf book was finished....so so very good! You made me laugh out loud when you said you're in chart heaven. It's such an awesome feeling when your knitting is such a joy and I'm happy for you. I know your shawl will be stunning. I love your shawls and I love knitting them as well! Something to wear all year long! Golden Orchids is a beautiful pattern and you've chosen a lovely color. I love knitting lace shawls too, watching them develop and the miracle of blocking. another gorgeous lace shawl and thanks for the advice about keeping a knitters notebook......I do make notes on patterns in ravelry sometimes but need to be better at that!! The shawl looks like it will be so comfy! I can't wait to see how the detail turns out. Crocheting is still my "cup of tea" and I am currently working on a baby afghan for the daughter of a friend! Loving how it is coming together! And I am currently reading Just Jane, a novel about the life of Jane Austen. I am enjoying both! I love your shawl, Karen. I've been considering reading Tell the Wolves... not sure I could handle the sadness right now though. It's definitely on my list! I love that you knit so many shawls - I am addicted to them myself, but I have to say they are what I use the most. Such pretty yarn. Keep those needles flying! You are a lace junkie! But if my lace looked as nice as yours does, I would be too. I'm still not reading, but I have been baking listening to The Hobbit audio book. I feel like I would've gotten through it much faster, if I had just reread it ;) But perhaps this is the route I should take with David Copperfield. At this rate I won't pick up another book until June ... happy knitting! You've always got such good things going on--shawls on the needles and wonderful books to read. What a gorgeous shawl. I love the yarn you are using. Chart heaven? I can follow any cross-stitch chart, but knit charts still have me stumped. loving your yarn choice! grey can be such a beautiful color! Beautiful! 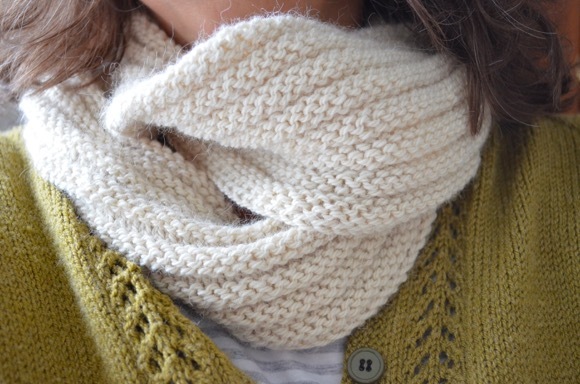 And how lovely to have a favorite item to knit! I am not sure what mine is yet. But I have loved working on blankets for the same reason--I love to watch them grow row by row! Glad you are chuckling at David Copperfield! Another shawl, wow, are you ever productive! I'm working on a variety of socks and just finished Owygen by Carol Cassella. It was great and also hard to put down. I've been trying to knit a shawl from a pattern that one of my sisters sent to me. I can't seem to get my head around it and have unravelled at least ten times. I hope one day to be just as good at shawl knitting as you are Karen. For now I can just dream.